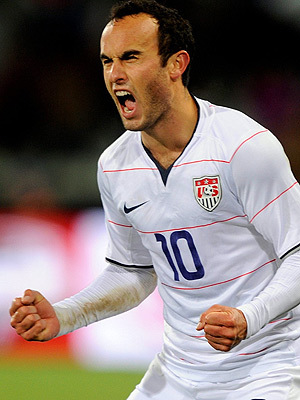 U.S. defeats Algeria one-nil to move to the ‘Knockout Round’ in the 2010 FIFA World Cup. Congratulations to the Yanks, as well as Los Tricolores de Mexico, another fiesty, Western-Hemispheric underdog that advanced. Perhaps we can still dream of the once-in-a-millennium matchup of the bordering nations? Will be a near impossibility as the Mexicans are set to face Messi and the Argentinians, but would be fun. In the meantime, celebrate on United States – inspirational, exciting victory. Wow..it went from gloom to jubilation! The world tried and tried to keep us out of the cup…all the refs were on the take…2 goals taken away that were clearly good…Algeria playing to tie even though they were already eliminated…But we showed the WORLD OUR HEART!!!! We have a good squad….LETS KEEP IT GOING!!!!!!! Pinche Donovan! Asi me gusta. Que viva Los Estados Unidos. Que golaso!! Obviously, you’ve never been to France.